what causes the black corrosion /deposit on the pcb? Is the finish on the copper silver or gold? Are the devices "lead free?" 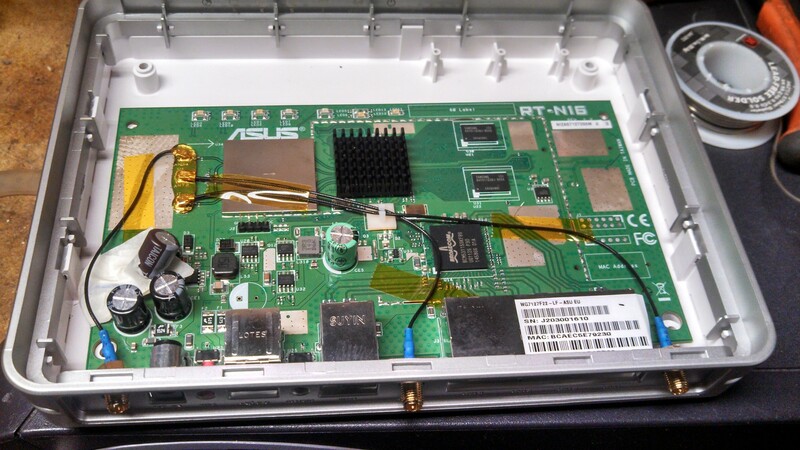 this image is same router model I had and I got it off the internet. I had same capacitor blown and as you can see the color of the plate should be same as mine except mine has all turn black. one of the microscope pictures looked like some kind of crystal growth. i looked up stannous sulfide, and not only is it brown or black, but is also a semiconductor, which means if it bridged across vias on a board, it can cause failures. and it dissolves in acids, but not in water, alcohol or bleach. if it were fungi it would dissolve in bleach. I used to see a similar corrosion on process control PCB's that were used in a local industrial plant which uses sulfuric acid in their process (wet milling of corn), therefore they had some H2S in the air there. The corrosion was on any copper the H2S could get to. The OP said in post #31 that "my basement was not fully finished before...", which implies that it has been finished now. I'd like to point out that gypsum wallboard -"aka drywall" - is predominately calcium sulfate dihydrate, which could be outgassing some sulfides. Several years ago, there was was a big problem in the southeastern US with wallboard imported from China having a significant corrosive effect on copper plumbing and electrical wiring in homes repaired after Hurricane Katrina. Its chemical in nature, the black specs being a soot of some composition. I would guess humidity even at low levels is enough to activate the soot. A sulfide is tempting, but i think maybe the actual culprit for the destruction is NOx based, the black simply being fine soot particle with NOx or maybe a sulphur based contaminant. I got some LPG, I will burn some in a lowered oxygen environment and see what the soot is like. For a while now I have been working on a project dealing with pm 10's, its mentioned on here somewhere. The particles are certainly the carrier but doubtful they are doing anything more than acting like a sponge for another chemical, burning LPG can produce a number of compounds and not just the normal products associated with Oxygen and the gas. The gas may be of high purity, but depends what kind of tank its in, how old that tank is, what tanker carries the Gas and so on. It is not a simple burn X and get Y, in real world scenarios you get some strange reactions, especially in a badly ventilated area. One reason I have given the answer I have, some forms of soot at very small sizes act slightly strange, they seem attracted to some metals and materials. Some even show an attraction to static electric or general electrical fields, sounds strange I know. Some even show a tendency to stray near the magnetic end of things. Currently I am looking into materials that do exactly what your boards are doing! I am researching materials that attract tiny soot particles from exhaust gas. In many ways your furnace acts like the exhaust's I am dealing with. Certainly on the lab side i produce the soot in a similar way to the conditions your describing. I will go look through my notes and see what the likely candidates are chemical wise. But the colour isnt the actual cause nor is it the final product. Its simply what is bring the chemical to the board. second page of my notes contradicts slightly some of what i said, the particles that are black are as I described. However its likely some of the 'other' black material is a product of the reaction taking place. In the instance where this happens the culprit is a sulphur based compound, but i need to look at the system overall to work out which might be the cause, all have simple chemical tests to determine which it is. That really simple, you need to get your furnace serviced and you must increase the airflow to the burner. Whatever it is dosnt matter, the cause is incorrect combustion. So short answer is, dosnt matter if its gremlins, slime from mars or anything else. you are working in a unsuitable area and putting your health at risk. Wow! This is an interesting thread. I actually had issues with BeCu needles soldered to a ceramic with a PCB trace. They were looked at under an SEM and EDAX was attempted and I forget what the actual findings were, but black deposits developed when the probes were heated to 200 C. So humidity + heat. It was black, but not like your stuff. It really turned out that the manufacturer didn't really clean the flux off well and they were unwilling to change their process. I, apparently was the only one using the probes at high temperatures. At one point they spot welded the edge and used Sn96 solder. then suddenly, they used 60/40 solder where the spot welds were and also the needles. They were willing to make all connections with Sn96. So, to make these probes work, I had to boil them with baking soda and water, dry and electroless gold plate before use. if you are using natural gas for heating, there could be some sulfides present. the gas itself might have small amounts to sulfur compounds in it naturally, or you may be getting sulfides from the methyl mercaptan they use to make gas smelly. i'm not sure what the products of methyl mercaptan are when it's burned, but there definitely are going to be some sulfur compounds present. radon is an inert gas, because it has a full outer shell of valence electrons, and it takes a lot of energy to get it to form compounds with anything. I think somewhere its mentioned the gas is LPG, all countries have regulations on LPG and any sulphur or other impurities are removed to any meaningful extent. If it was natural gas (pretty much talking methane as the primary gas), then yes you are going to get sulphides. In the digesters I have it dosnt matter how many or what kind of scrubbing you use, you always get some impurities. If i was near a gas main i could inject mine into the grid most days, but some days you just cant clean it up enough. Mercaptan's are extremely unlikely, you would smell those miles away same as Thiols. If you have ever smelled really bad rotten flesh then you get an idea how bad a mercaptan is, while putricine isnt a mercaptan its smell is not as bad as a mercaptan! Thios were used years ago in stink bombs, to my smell mercaptans are a level above! Dislike the post all you want, if you think thats a fungus or bacteria your way way off. Few microbes could tolerate copper, those that can couldnt tolerate solder! Think about the Tin is solder, if you metabolise copper what would happen if you came into contact with Tin? HINT look up the electro potential of both and decide which would displace. I just read what you wrote!..... explain why you think i am wrong?? I have pretty much said what you did, the one exception being if he is using it wont/cant be sulphur based, and would likely be nitrogen based. But apart from that we agree, so i think a dislike on a post that pretty much agrees with what you put is odd. I doubt the mechanism you propose because of where its happening, and the fact it isnt specific boards.